At Shred Wise Inc., we specialize in providing paper shredding services to Garden Grove, California. We have nearly a decade of experience, use some of the best mobile shred trucks available on the market today, and have strict controls in place to comply with local and federal privacy laws, including HIPAA, FACTA, and Gramm-Leach-Bliley. We are readily available seven days a week to destroy your sensitive or confidential documents, and provide mobile shredding services to both residential and commercial clients in Garden Grove Monday through Friday. 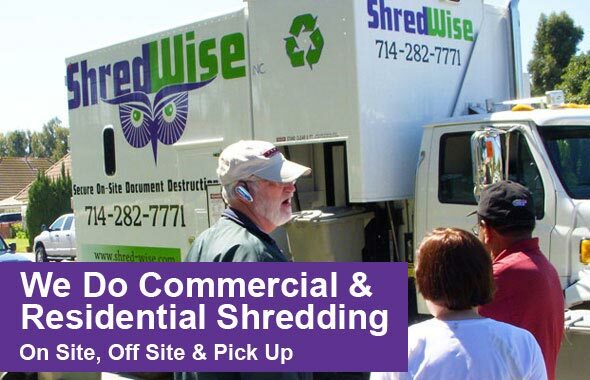 Unlike many mobile shred companies serving the Garden Grove area, Shred Wise is locally based and focused. Our drop-off location is located at 3222 E. Chapman Ave., Orange, California. This is also where our shred trucks are based. Because we are centrally located and keep our routes primarily in Orange County, we are better able to serve individuals and businesses in the Garden Grove area. We not only can respond faster to last-minute purge requests, but can also afford to keep our rates low. Additionally, because Shred Wise is a family-owned and -operated business, we are invested in achieving 100% customer satisfaction. We always greet our Garden Grove clients with a smile, and look to offer above-and-beyond service. We are so confident in our level of service that we don’t lock our clients with scheduled on-site shredding services into long-term contracts. Our service agreements are essentially month to month and feature no hidden fees or complicated language. And, whether you require our on-site or off-site shredding services on an as-needed or regularly scheduled basis, you’ll receive the same level of friendly service. Call (714) 282-7771 today to learn more about our mobile shredding services in Garden Grove. When you call, you’ll reach a live person who is thoroughly knowledgeable in all aspects of document destruction. Everyone on our staff has been carefully screened and consistently follows the industry’s best practices for document shredding to keep your confidential information safe and secure. We are National Association for Information Destruction (NAID) compliant, and are licensed, bonded, and insured. We provide a “Certificate of Destruction” with every shredding job, and recycle 100% of the paper we shred. Certificate of Destruction at the completion of every shredding job. Ability to watch documents being destroyed on site. Friendly, dedicated, and professional service for all clients. Compliant with all privacy legislation (HIPAA, FACTA, GLBA). Capable of accommodating last-minute service requests. No long-term commitments, hidden charges, or automatic renewal requirements. Almost a decade of experience serving individuals and businesses in Garden Grove. Both individuals and businesses can benefit from shredding services in Garden Grove. Document destruction not only helps commercial clients comply with privacy legislation, but also helps all types of clients protect sensitive information for themselves and their families, employees, and customers from getting in the hands of thieves. That’s why Shred Wise has designed its shredding services to be cost effective and customizable — we want privacy protection to be available to everyone. If you would like a shredding solution designed for your document destruction needs in Garden Grove, call today. Because our client base includes individuals, families, estate managers, doctors, hospitals, medical billers, real estate companies, mortgage companies, financial planners, banks, municipalities, police and fire departments, libraries, schools, universities, aerospace companies, attorneys, CPAs, veterinary clinics, animal hospitals, retailers, restaurants, corporate offices, and more, we routinely shred a wide array of documents. This ranges from financial records (bank statements, invoices, quotes, cancelled checks, etc.) to employee records (job applications, payroll statements, W2 forms, tax forms, etc. ), and from medical records (medical files, prescription forms) to personalized junk mail. In general, we advise our Garden Grove clients to shred anything with more than two points of personal information, such as name and address, name and account numbers, and phone number and email, as well as anything with social security numbers, driver license or state ID numbers, passwords, and birth dates. We can handle any amount of paper documents and files, as well as help you destroy CDs, DVDs, and hard drives. And, with our mobile services, we can make shredding extremely convenient. You can drop off small numbers of boxes of paper at our facility any day of the week, or you can have us come to you with either our mobile shred truck for on-site shredding or our secure panel truck for off-site shredding Monday through Friday. Call us today for a free quote. Shred Wise Inc. offers the best value in Garden Grove paper shredding services, whether on site or off site. Our shredding services not only employ the information destruction industry’s best practices for security, but are also competitively priced. Moreover, we stand apart from our competitors due to our extensive knowledge, friendly service, responsiveness, and flexibility. We’ve served thousands of satisfied residential and commercial clients over the last eight years, and are confident that we can provide you with a cost-effective shredding solution that meets your needs. Our regularly scheduled mobile shredding services in Garden Grove are for those who frequently work with or produce documents with sensitive information. We can visit your business on a bi-monthly, monthly, bi-weekly, weekly, or even daily basis, and provide you with as many locked shred containers as you need, at no additional cost. Our ongoing, scheduled shredding services are designed to be very flexible, so that we can readily meet the changing needs of our Garden Grove commercial clients. This means that we are happy to work with you if you need to change the frequency of our shred visits, require an extra visit before your next scheduled service. 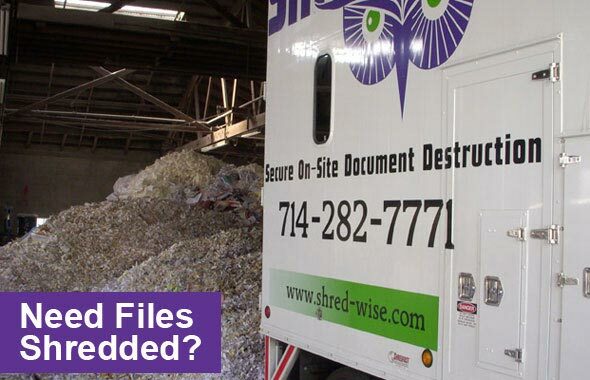 In addition to our mobile shredding services, Shred Wise also offers secure and cost-effective off-site shredding for clients in Garden Grove who need to purge and destroy a large volume of documents all at once. Off-site shredding can involve us picking up your boxes and/or shred bins from your home or business in Garden Grove and transporting them in a locked truck to our facility for shredding. Or, it can consist of shredding any documents you bring directly to us. In either case, we’ll shred your documents according to the highest of standards for an affordable rate. For your peace of mind, you will be provided with a Certificate of Destruction. Call today to learn more about off-site shredding services for Garden Grove, California. 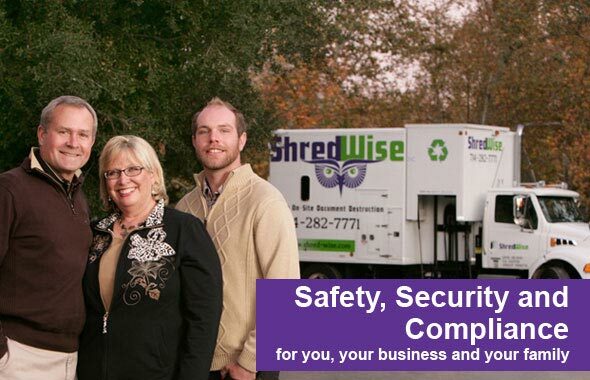 When you work with Shred Wise, you can trust that your confidential documents stay secure. We are happy to supply our Garden Grove clients with free locked containers (choose from a 19″W x 19″D x 35″H console or a 23″W x 29″Dx 40″H rolling bin) to store their sensitive papers in between service visits, and use state-of-the-art mobile shred trucks to perform our shredding on site or off. These shred trucks can shred up to 6,000 lbs of paper an hour with minimal dust and maximum effectiveness. They feature an auto-synchronized curbside lift and feed system, onboard shred cams, industrial-grade rotating blades that pierce the paper and then tear it apart, and a compaction ram that mixes the shredded paper with hundreds of pounds of paper already in the storage area. Both of our lockable shred containers and shred trucks comply with local and federal privacy laws, including but not limited to HIPAA, FACTA, and GLBA. Call today to learn more.